Takaful (Islamic insurance) is one of the pillars of Islamic finance markets but its growth requires further impetus. Takaful accounted for USD46 billion of global Islamic finance assets in 2017, up by 4.5% from 2016*. More than 45 countries have takaful operators or takaful windows (which enable insurers to offer sharia-compliant and conventional products side by side), totaling 324 entities. However, takaful continues to only represent 2% of total global Islamic finance industry assets. Takaful, which translates to “solidarity” in Arabic, is a form of Islamic insurance whereby participants agree to contribute a sum of money as a donation into a common fund that is subsequently used for mutual assistance of its members against specified losses or damages. Takaful companies, like other Islamic finance companies, face a variety of challenges that vary from one country to another. This is on top of general insurance challenges and issues related to their individual circumstances. Some of these challenges include sharia standarisation, developing regulatory and governance frameworks for takaful, consumer awareness/attraction and the availability of re-takaful (Islamic re-insurance). In addition, takaful companies continue to face competition from conventional insurance companies, many of which are more established. Takaful and general insurance are at different stages of development in various Islamic finance markets and practices differ from one country to another. For example, in Saudi Arabia, insurance is provided by insurance companies operating in accordance with the principles of cooperative insurance, which states that the provisions of the articles of incorporation should not be inconsistent with the provisions of the Islamic sharia. Whereas in the UAE, Malaysia and Pakistan, takaful is the dominant form of Islamic insurance. In the UAE, takaful made up 15% of the total insurance market in 2017, with health and motor takaful dominating the business by gross written premiums (GWP). Although substantial, this is still low compared with the UAE Islamic banking where the Islamic financing base accounted for 30% of sector financing at the end of 2017 and Islamic deposits were 27% of sector deposits. The growth in Islamic banking is largely due to the broader adoption and innovative structuring of sharia-compliant products among new and fast-growing franchises in Islamic banks. Saudi Arabia’s cooperative insurance model is a sharia-compliant structure where 10% of the net surplus of an insurer’s profit is returned to policyholders annually, by direct payment or reduction in the premiums for the following year. However, in contrast to takaful, it does not include any provisions relating to sharia-compliant investment requirements, sharia-compliant boards or the segregation of takaful funds from shareholder insurance funds. Still, most licensed Saudi Arabian insurers also offer takaful products. The Saudi Arabian cooperative insurance market is concentrated in health and motor, accounting for 52% and 31% of GWP respectively in 2017 (2016: 51% and 33%). Life insurance makes up only a small proportion of the Saudi Arabian insurance market. Its growth is constrained by the relatively generous social security arrangements for locals and the ability of non-Saudi employees to buy life insurance products through other countries in the region. 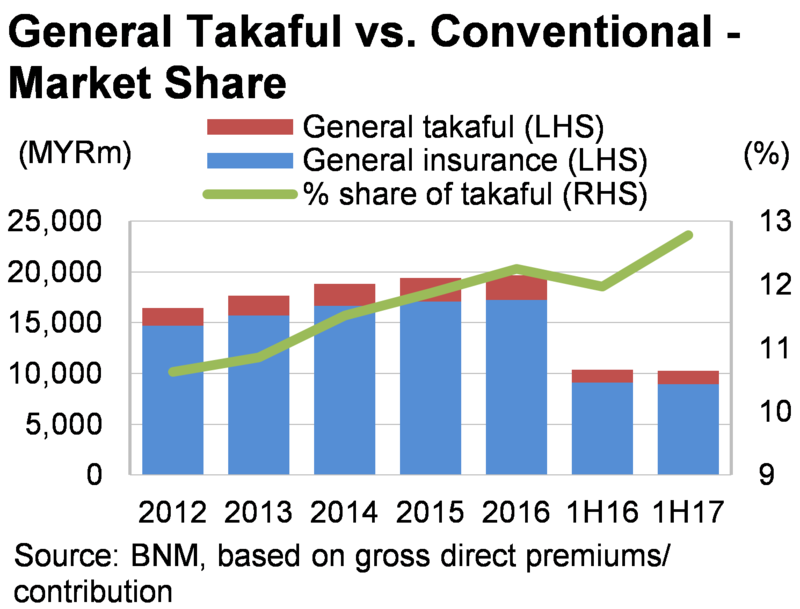 In Malaysia, the takaful segment is likely to benefit from the government’s push for affordable insurance and higher insurance penetration, particularly as Muslims dominate the country’s population. 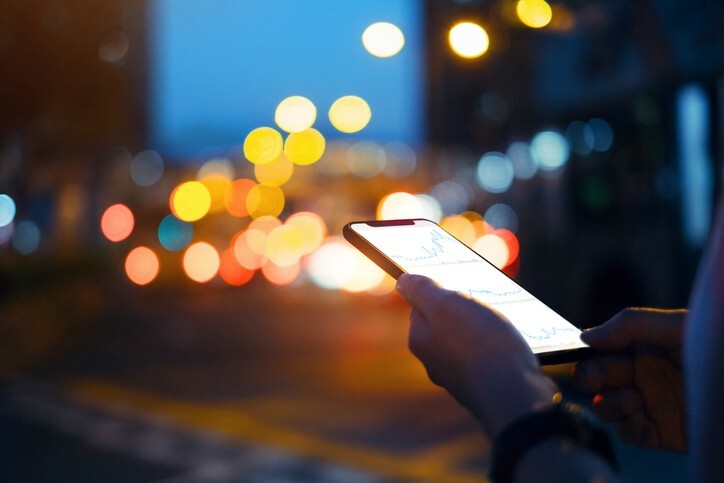 Greater adoption of technology, particularly in distribution, will be important for operators to capture untapped population segments and younger consumers with greater cost-effectiveness. There are three main types of takaful customers: customers who are sharia-sensitive, customers that are not totally sharia-sensitive (and may not even be Muslim) but relate to the concept, and customers and businesses that recognise takaful has a competitive offering. 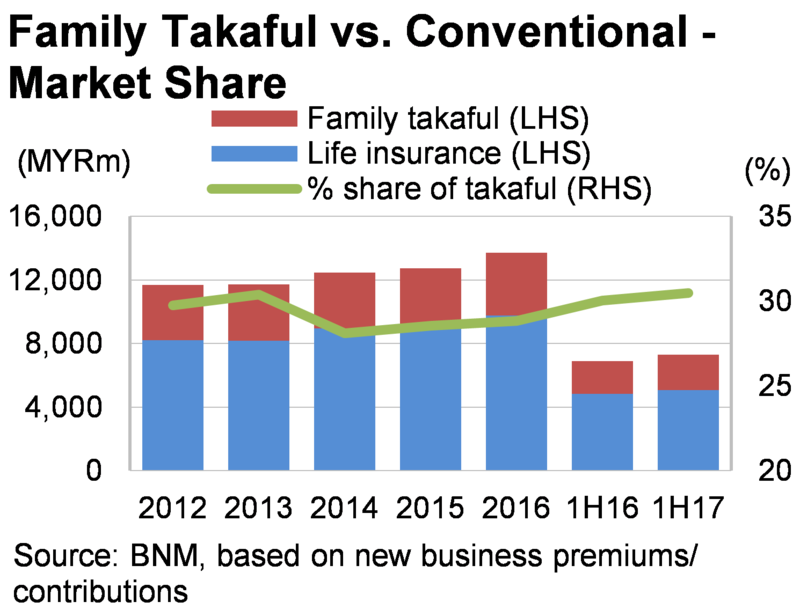 The takaful industry still faces numerous challenges as it strives to grow its footprint in markets dominated by conventional firms and where insurance penetration is low. However, recent and developing regulatory changes like making health insurance compulsory in parts of the Middle East could provide a meaningful boost for takaful growth in the medium term as compulsory health insurance spreads across the region. Bahrain will introduce compulsory health insurance in 2020 and Kuwait is also working on similar new laws. This could be accompanied with increased awareness and education around insurance in general and Islamic insurance in particular which could enable the sector to become more established.